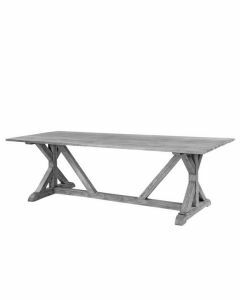 This trestle-based Provence tables are designed with rustic, old world charm. Two table top options are available: either a galvanized steel top that is painted to resemble stone, or the classic teak top with thick wood slats. 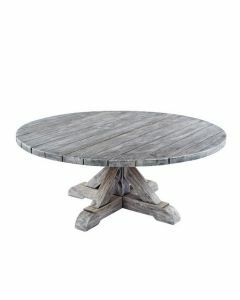 All teak wood is solid, rustic, and hand-painted in a gray finish for a weathered appearance. Natural features in the wood such as knots, checking and other imperfections are some of the characteristics that give these tables their rustic qualities. If left uncovered, the gray finish on the wood will start to wear away after a season of use. Once it wears away, exposing unfinished teak to the elements, the wood will begin to acquire the beautiful gray patina that is typical of untreated teak. Overall smaller table measures 50"D x 29.5"H, and larger one measures 59''D x 29.5"H. Select your size in the drop-down menu below. Click on images for greater detail.